The Yen was under pressure on Friday, as equities and US Treasury yields soared worldwide. A much better earnings report from the US surprised the market on Thursday, fueled later in Asia by Chinese data, showing that bank lending rose in March while the trade surplus beat market’s expectations. These factors changed the market sentiment to the bulls’ side as traders moved away from safer government bonds, into a risk-on mood. We expect this momentum to last at least throughout this upcoming week, keeping in mind that the market is still fragile, any negative news can change the whole bullish narrative. There are no macroeconomic releases scheduled in Japan until Wednesday when the country will release its March trade balance data. 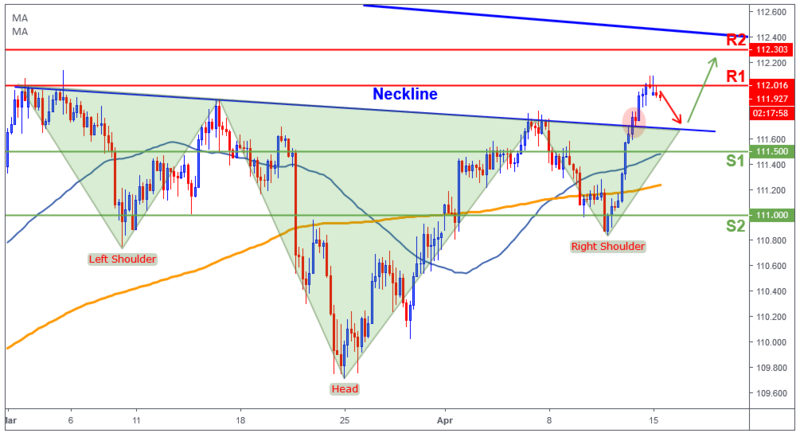 The Dollar/Yen continued its bullish momentum on Friday, after breaking out from the invert H&S Neckline. Currently price is facing some resistance at 112 (R1), we expect a pullback to retest the broken Neckline as a new support. If it holds, then the bulls will likely take over and possibly break above 112 heading towards a major resistance area 112.30-40. On the other hand, if price couldn’t hold 111.50-60 support area, then this pattern would be invalidated and the bears will take back control in the short-term.